SMALL CARS will become a popular feature in no distant future; don’t say you were not warned. 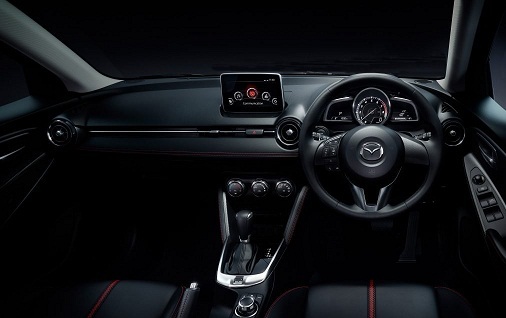 The Mazda 2 might be small for your liking but DOES NOT compromise on important features safety and fuel. With the ever-increasing fuel- next month in November- one will have to opt for ‘trivial’ cars in the form of Mazda 2. Smaller cars come with smaller engines, which are – by and large – more fuel-efficient than their larger cousins. So you save money at the pumps, too. We tested this beau, and one must indicate although its not in the range of its competitors, one thing certain you’ll enjoy playing and fiddling with it. Unfortunately, space or luggage is a major problem as we experienced, try fitting your dog and its puppies might not be ideal. But the smaller it is, the more safer. Agree? They’re increasingly being offered with many of the luxury items from bigger ranges, as well as full suites of safety equipment – including comprehensive sets of airbags as well as electronic safety aids. The smallest Mazda is, truly, one of the best-built cars in its class… and if you can find me someone who has a horror story to tell about problems with a new Mazda, yours truly will run for dear life- stru. 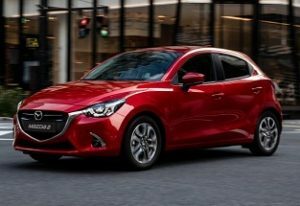 Available with a 1.5 petrol (82kW) or diesel engine (77kW), the Mazda 2 doesn’t really have enough power to push what is really an excellent chassis. The car really handles well and is satisfying to drive, although, I must admit, it doesn’t stand out from the crowd of competitors..
Our 1.5 auto model came equipped with a full complement of airbags and electronic safety systems – including lane departure warning, blind spot monitoring, traction control and a rear view camera and park assistance radar. The aircon was superb. Mazda 2 derivative is fitted with a host of standard features namely Hazumi 1.5L DE auto. Not enough leg room but the interior and seats are sporty. Features include; Shark-fin antenna, auto-folding side-mirrors, Heads-up Display (HUD), leather seats, side and curtain airbags, reversing sensor as well as lane departure warning system (LDWS) safety feature. In addition to the LDWS, the diesel model also introduces Blind Spot Monitoring (BSM). Other features include the option of two new exterior colours (blue and red) for all models, the addition of LED foglights, cruise control (for Dynamic spec and above) and paddle shifts for auto models. All models sold with a 3-year/unlimited kilometre warranty, 3-year roadside assistance, a 3-year service plan and a 5-year Corrosion Warranty.